A lot of you expressed interest in the newly released Innisfree mini-foundations in my April Beauty Haul, so sorry for this somewhat lateish review. Well, Innisfree decided to release 4 'smart' foundations in mini sizes, so that it's not only easy to use up, and cheap, but also easy to mix the foundations to customise any particular skin needs for that day! I ended up buying two of the range - the Perfect Cover, because I was on the lookout for a fuller coverage product, and the Super Moisture, because of my dryer skin type, and because I like a dewy look. I bought them for about USD$8 each online. Packaging wise, it's quite plain. The 15ml foundation comes in cute, travel friendly squeeze tubes, with a plastic twist cap. The only differences between the packaging for the range is a slight colour variation of the tubes, as well as the titles on the packaging. I feel like there's enough foundation for about 3 weeks max if you wear foundation several times a week - on the upside it means you can easily finish it and not waste the money you spent on it, but the downside is that if you love it, you'll need to buy it in bulk! Claims to be a moisturising foundation, that makes skin look glossy and feel hydrated. The Super Moisture foundie is light and creamy in texture (it's not really like a runny Western foundation, but more similar to Asian bb cream), and has that signature Innisfree herbal scent. It can be applied however you like, so I just apply with fingers. It spreads easily, and works best by patting it after you spread it onto the skin. I find it to be a light coverage product - it doesn't cover blemishes or really bad redness, but it does brighten the skin so that blemishes and other skin issues aren't so obvious. It does have a glossy finish, though it's not a very obvious effect - which is good because it won't look like greasy skin. Skin just looks healthy and bright, and a little glossy. I wouldn't recommend it for oily skin types though, or anyone who likes a matte finish. I didn't find it to feel heavy or greasy on the skin - it does feel a little hydrating but not very obviously so. Lasting power is a little lacking - without primer there's fading of the foundation on my forehead and jawline within 5 hours. I like this foundation, but it's not overly amazing. If I want a lighter coverage, glossy look I tend to stick with my bb creams, so unfortunately there's not a huge need for this in my collection. Claims to be a hydrating, high cover foundation that covers blemishes. Again though this is a foundation, the consistency is very much like an Asian bb cream, slightly thick and creamy, but which thins out as you apply it. To apply this I squeeze a bit onto the back of my hand, thin it out by 'mixing' it with my finger and then dotting spots onto my face, before spreading it all over. I like the coverage this foundation gives me - it doesn't cover active blemishes, dark circles, or bad redness very well, but it's got great coverage for uneven skin tone/pigmentation, slight redness, and fading acne scars. The Perfect Cover doesn't feel heavy on the skin - I only apply the one layer, just like I would with bb cream, and although it does have a more 'makeup look' finish, it doesn't look or feel cakey or thick. The finish is semi-matte on the skin, and really brightens my skin tone. It can look a little 'flat' on my face without blush/highlighting contouring because of the higher coverage, but a bit of blush fixes that. The foundation feels a bit velvety on the skin, but is fairly smudge-proof as long as you aren't rubbing at your face. Lasting power is quite good, didn't have any complaints there. This is one foundation that I really liked, however there are a lot of negative reviews of this out there, and I can understand why. This claims to have perfect coverage, but it doesn't cover all imperfections. I'd recommend this if you're after coverage for uneven skin tone and faded blemishes, but if you're currently dealing with acne or bad redness/acne scarring it won't meet your coverage expectations. I've read it's not long lasting on oily skin either - I've dryer skin so I didn't have any issues with that. All in all, the Super Moisture is an ok foundation, but lacks coverage and long-lasting wear time, so I won't be repurchasing it. As for the Perfect Cover, I'm kind of torn - I like how it looks on my skin, yet it didn't deliver perfect cover for my active blemishes. I guess for the price, it's quite a good deal, and it does give slightly better coverage than other foundations I use at the moment, but I still prefer something with flawless coverage. I think I'll keep looking, but this will stay on my backup list for now. If you have any perfect cover foundation recs, do let me know! Time for a trip down memory lane - today's post is all about my makeup journey over the last few years - I wanted to see how my makeup style has evolved over time. When I first started blogging, I honestly had very little clue about beauty and makeup. I could put on foundation, and could handle a curler and mascara, but that was it. Kind of laughable now that I look back, how I wish I knew better back then! Unlike some girls who took to the ins and outs of makeup very quickly, at a young age, I didn't become 'good' at putting on my face until well into university. The first photo is from late 2010! I had very bad acne scarring at this stage, after a year course of Roaccutane, which although gradually diminished my acne problem, left my skin very prone to scarring. Because of that I would refuse to leave the house without heavy foundation on - my HG foundie at the time was the very expensive Clinique Anti-redness foundation (RRP $50). The only other makeup I wore was a gold glitter eyeshadow, and mascara - haha excuse the smudging - it was a very, very hot day when this pic was taken! 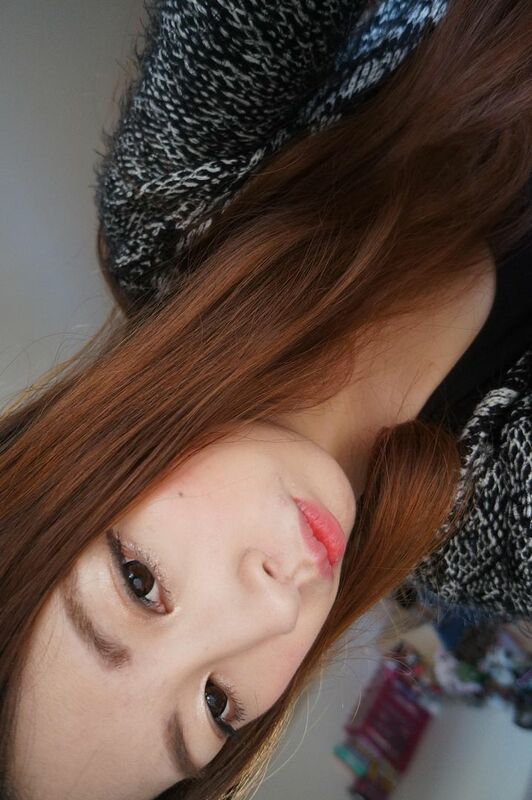 You can also see I had overplucked eye brows, and didn't know how to wear coloured lipstick hehe. Fast forward one year, in late 2011 I started my blog! What sparked it? 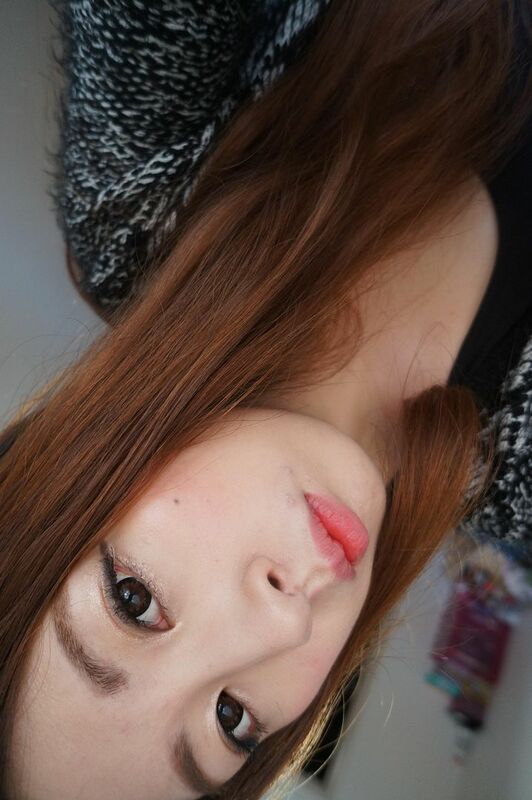 I finally got a paypal account and bought my first pairs of circle lenses and Japanese branded false lashes. 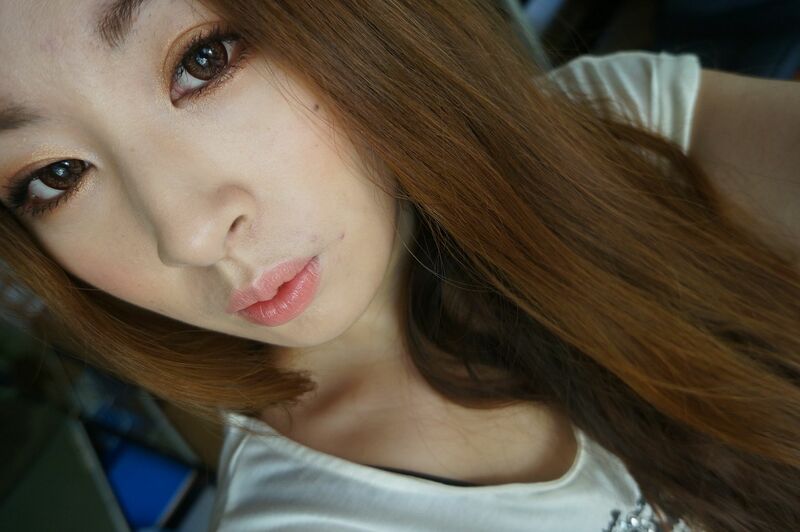 I loved reading gyaru blogs, and wanted to make myself look like a doll too. 2011 was also the year I was introduced to the wonders of bb cream - my first one was the Etude House Precious Mineral bb cream - one I still use today~! It's late 2011 now, my blog was still small and slowly growing, but I loved it and was having so much fun. My makeup style was pretty heavy on the eye makeup with long, dolly lashes (upper and lower), eyeliner, and dramatic patterned circle lenses. Neutral eyeshadows only. Still had too thin brows, and no lip colour! Asides from my eyes my weird lip shape was another big insecurity for me, and I was too afraid that a coloured lipstick would emphasise it, so I stuck to slightly tinted lip balms only. In 2012, my beauty interests started to shift a bit. 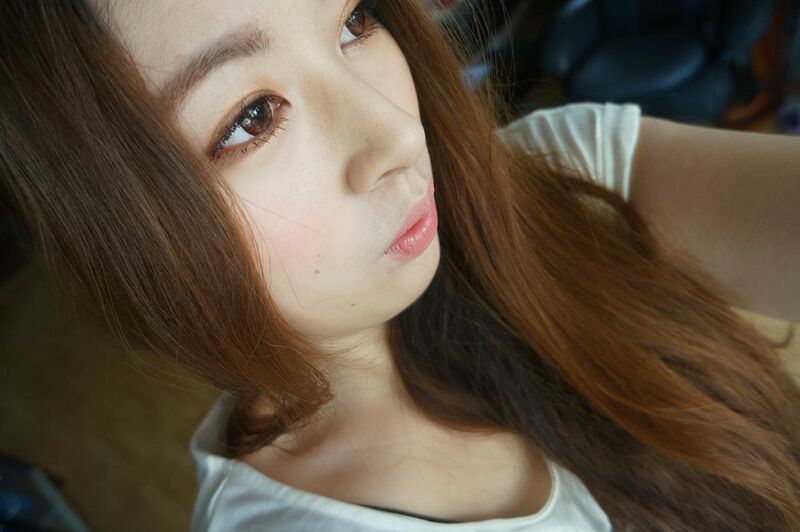 Where I had started blogging with an interest in dolly Japanese makeup, I was now starting to take an interest in Korean uljjang beauty style, which seemed more natural but still so pretty looking. I also started learning how to use brow pencils too, and started matching my brows to my coloured hair with brown pencils or brow mascara. Shifting into 2013, heading into my second year blogging, and hallelujah I finally started experimenting with lipsticks. 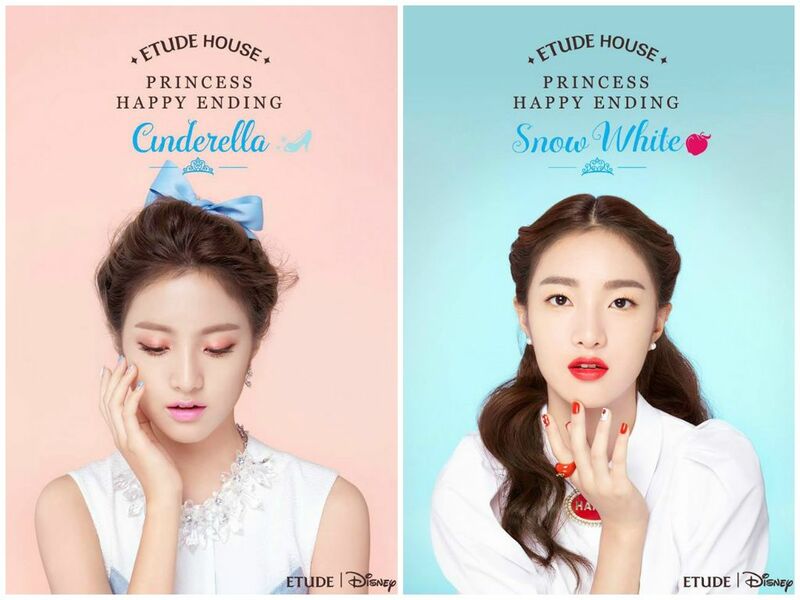 Very natural looking lipsticks of course, but a step in the right direction at least, lol. I was still loving the winged eyeliner as my go to look, and was skipping mascara or falsies more and more - mostly out of laziness. My eye makeup was still pretty much the same - I still preferred my simple neutral colours, but I was starting to experiment with less feline eyeliner flicks, for a more straight, slightly downwards eyeliner look. I also started wearing more natural looking lenses, for work, and I found that I really liked a more natural look on me. I still like to wear really dolly lenses when I do blog posts, but I wasn't as insecure about my eyes as I was back in 2010/11 any more. And now we come to current times - Mid 2014. Anyway! This is my current beauty style...it'll probably continue to change, because there's always going to be trends and looks that are going to influence me somewhat...but yep, it was interesting to compare my makeup looks over the last few years. Have you changed your beauty style over the years too? Dramatically or just a little? Well, today I'm going to follow up with their other recent release - the Golden Coast Palette. As the name suggests, this beautifully and vibrantly packaged all in one set is inspired by the Australian beaches and coastlines. 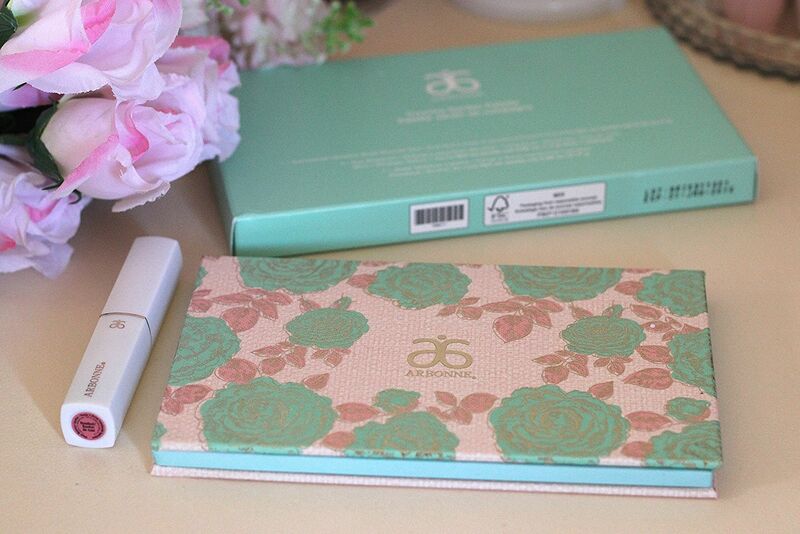 Spring is nearly upon us (or at least those of us in the Southern Hemisphere), so today I want to show you Arbonne's new, limited edition, Spring makeup release - the Country Garden Palette. The Country Garden Palette is an all-in-one makeup compact set, with a sheer pink lipstick, 4 eyeshadows, and a blush and bronzer duo all in one. It's also created with a vegan formula (yay! ), and dermatologist tested. Peripera is a really cute Korean brand, with the most darling packaging! Their packaging is cute, with a hint of edginess. Peri's Water Lip Tint is a watery lip and cheek tint, which comes in 5 different shades. I have the first shade Cherry Juice, which as the names suggests, is a sweet cherry red shade. The tint comes in a generous size, seeing as only a little goes a long way, in a little glass bottle with a plastic cap. The cap is illustrated with a very cute looking figure - if you look closely you can see she also has red lips to match the tint. There's a furry applicator attached to the lid for application - I prefer it to the brush applicator in the Benetint, but as the applicator is quite large and can soak so much tint, it can over apply easily if you aren't careful. The tint formula itself is very pigmented for a water tint - especially in comparison to the Benetint (the only other red tint I own at the moment) and the Etude House Cherry Pink Tint (which is more of a milky formula rather than watery). With the Peri tint you can go soft and natural, or bright cherry red depending how much you apply and how you apply it. For a soft and natural application I tap a drop or two on my fingertip and then sweep it onto my lips and lightly patting. And for a much more pigmented lip I apply directly with the applicator and smooth it out with my finger if needed. As a cheek tint, because it's so pigmented, you have to be more cautious when applying it - two light dabs of the applicator to my cheek is all I need. And because it's a watery formula you have to work quickly before it dries up. I've actually been loving this a lot - this even featured in my July Beauty Faves. It's a gorgeous colour - I've been wearing it softly rather than fully pigmented, and it just gives lips a pretty cherry popsicle like sheen. I was quite impressed with this tint, so I'd definitely recommend giving this a go if you're on the hunt for a cherry red tint! Have you tried any Peripera makeup before? It's sort of an 'upgraded' version of my normal daily look - so basically my everyday look, but more made up. 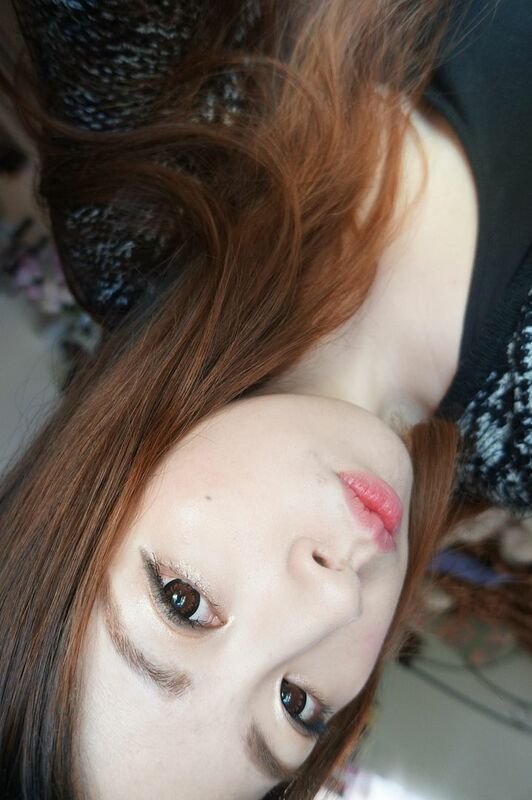 I will have the Peripera lip tint review up tomorrow night! 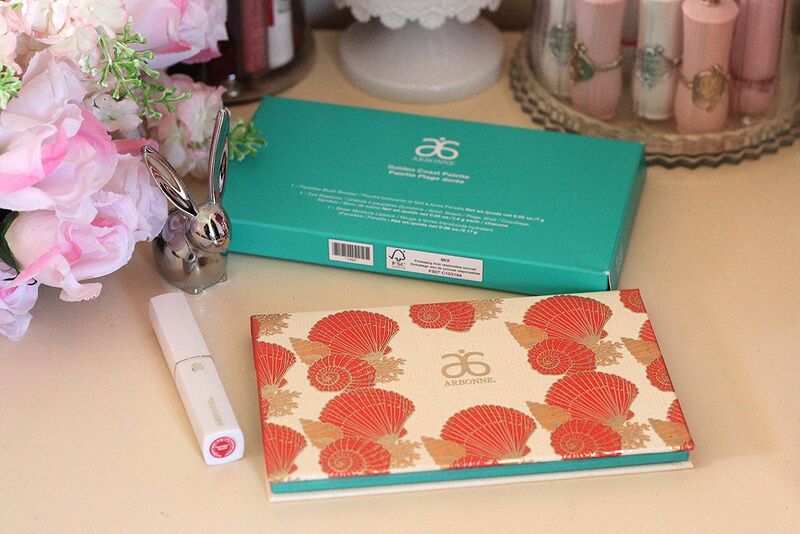 Lovelies, it's time for another Beauty Faves post! Long name, but it's just basically a makeup primer. I bought this ages and ages ago - used it once and didn't think it did anything so I put it away. Recently I decided to try it again as I can't bear to let it go to waste, and ended up loving it! It's perfect for dryer skin types as it's nice and hydrating, and it makes my bb cream glide on nicely. It also makes my bb cream last longer too. It's really good for rushed mornings too, if I'm running late I'll just apply this rather than moisturiser, as it's hydrating enough to act as both moisturiser and primer. 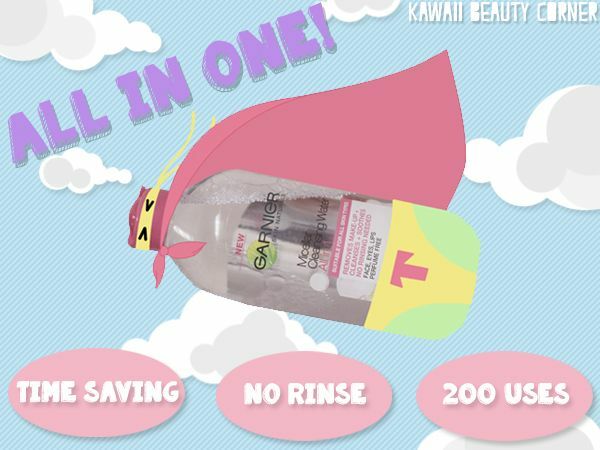 Ahhhh, just realised I photographed the wrong tube >.< Hehe, I bought both the Super Moisture and Perfect Cover. But anyways, the packaging's the same! I've only used the Perfect Cover foundie twice so far, but I'm really impressed. The coverage is soooo good! The reviews I've read on these were pretty negative, but I personally really like this (so far). It's thick like bb cream, rather than liquid-y like Western foundations, and has really good coverage for slight redness and faded acne scars. I've been using a lot more lip tints than lipsticks the last few months, and this Peri Pera one has become a fave recently. 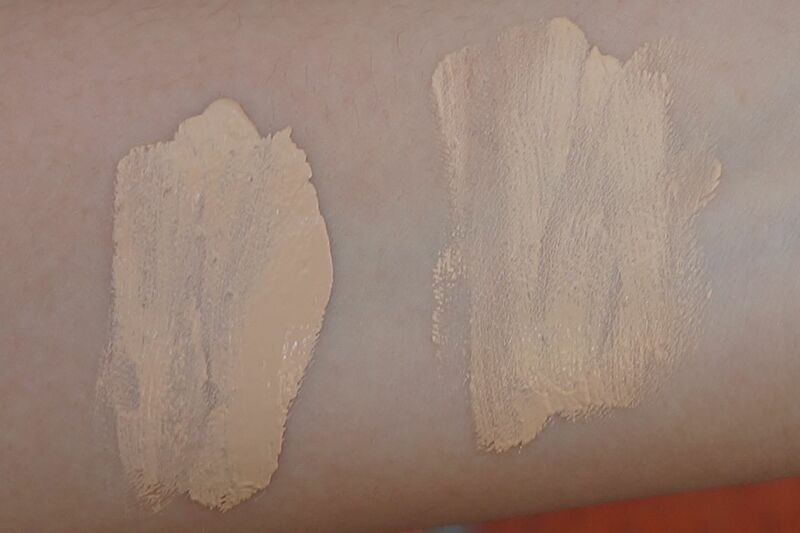 It looks similar to Benetint, but is quite a bit more pigmented. I really like it, and plus the packaging is too cute! The much cheaper dupe of Bioderma's cleansing water, you can see there's only a splash or two left in the bottle, lol. When I got my eyelash extenstions I had to switch from my oil cleanser to one that was oil free, so I got this, and have been loving it ever since. It cleanses really well, despite looking just like water, and it's gentle and non-drying too. 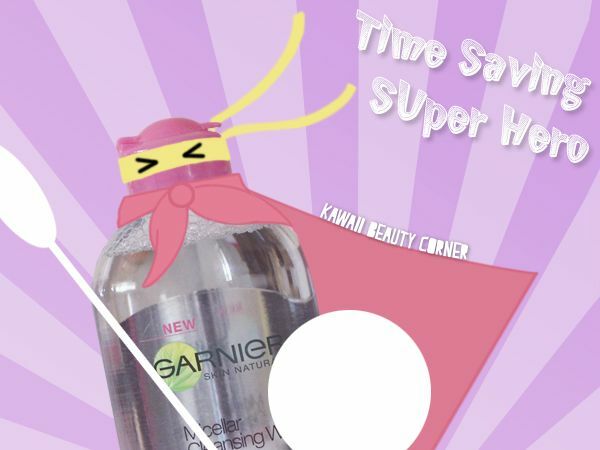 I did repurchase this as it works well, the bottle lasts ages, and it's affordable. Let's end it here - thank you for reading lovelies, and what have you been loving this July?